Ah… this one is a story unto itself. 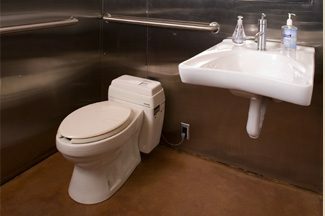 For more than 75 years, the Clivus Multrum composting toilet has been used in homes, parks and commercial buildings as the sole method of treating toilet waste. The composting process is reliable, convenient and safe. It saves water and converts human waste into useful fertilizer. But it’s not so easy to get one approved. It took us 12 months to win our battle with the State of Massachusetts allowing us to install an indoor compost toilet at the Old Oak Dojo. How’s this for surreal: At our first variance hearing with the State Board of Plumbers and Gas Fitters, the motion to approve our variance was denied; and then the motion to deny our variance was denied. Confused? We certainly were. But we persevered, and six months later, our ablutionary purgatory finally ended on March 26, 2014. We are now official recipients of Variance 6-1 — setting a new precedent for the approval of indoor compost toilets in the City of Boston.